Glass has been around since Roman times. But until the 17th century, when a timber shortage led to the creation of coal-fueled furnaces, glass was too fragile to use for storing or transporting wines. Hand-blown bottles were more often used for serving wines while barrels or large clay pots (amphorae) were used for storage. 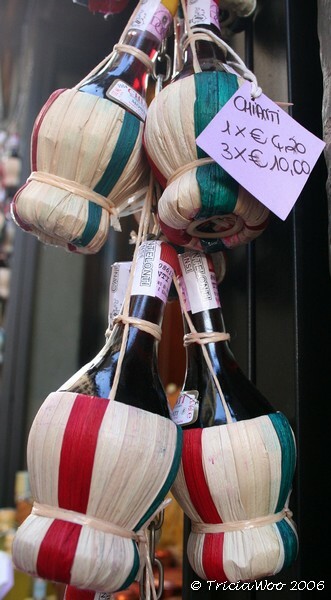 When necessary, some of the tear-drop-shaped glass bottles were wrapped in straw both to protect the glass from breakage and to allow the bottle to stand upright on a table (now associated with the traditional marketing of straw-wrapped Chianti bottles). It was the invention of the coal burning furnace that brought about the next major change. Sand won’t melt into glass until the heat reaches at least 1500 degrees. Hotter 17th century coal furnaces allowed for creation of thicker and darker glass. This ability, paired with the new cork closures which came into fashion at the same time, brought forth the use of strong glass bottles for wine transport and aging. At this time, before standardized sizes and long before labeling laws, bottles were of many different shapes and sizes and rarely labeled with anything but a maker’s stamp or painted mark. The olive green hue to the glass varied from light to dark due to the level of impurities in the ingredients of the glass, but not by design. As winemaking became more possible and popular, people bought less in bulk and more by name/winery. By 1730 it was necessary to start a new practice of “Binning”, or storing corked wine bottles on their sides (because there were a lot of them). 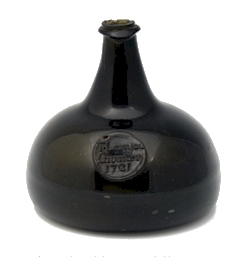 This made necessary the change in bottle shape from wide-based bottles (bladder or onion shaped) to a standard cylindrical bottle still used today. 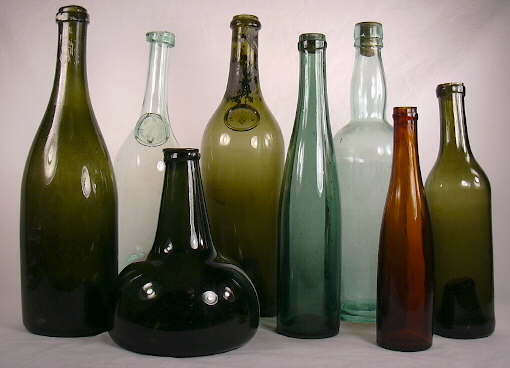 Without standards for bottle sizes, it was illegal in England until 1860 to sell wine in bottles. Instead, wine was measured from the barrel and then poured into bottles, and bottles were often brought in by the consumer (which was more economical than buying the store’s bottles). Until the EU began enforcing standards for bottle sizes in the 1970’s, bottle sizes varied from 65 to 85cl (still about the size of one lungful of air from a glassblower’s lungs). Today’s bottles are shaped logically and scientifically… ”Bordeaux” bottles are shaped with a short neck and high “shoulder” to trap sediment during pouring and to allow long and stable stacking and storing. Champagne bottles are thicker and shaped to handle more pressure and to fit in special racks during the lengthy production processes. On bottles with an embossed crest or symbol (such as Chateauneuf du Pape), you’ll notice a substantial notch in the bottom or side of the bottle…this notch assists a labeling machine with finding the bottles “front” to place the label consistently and correctly. To market to customers understanding lots of different languages in Europe, traditional unique bottle shapes and colors became the universal marks of certain wines and countries as well. Green tall slender bottles were German Rieslings. Portuguese Ports were marked with white stencil lettering on darker bottles with plumped necks. Chianti retained the onion shaped bottle wrapped in straw. Now, the famous rooster adorns a label around the neck of Chianti bottles instead as a universally translated mark of origin. Restaurants and airplanes create the most demand for small-sized bottles, while large-sized bottles are reserved mainly for publicity and celebration due not only to the high cost of hand-blowing these rarely-used bottles but also the difficulties in storing, marketing, and serving them. The 750ml bottle is a standard since it is economical, consistent and easy to handle.